is over 65% OFF the regular selling price! It was available at Chili's Greenbelt 5, Greenhills, Tomas Morato, and Chili's Too at the Power Plant Mall in Rockwell. A friend who works in Hyatt Dubai Hotel, invited us for snack, however we ended up eating dinner. 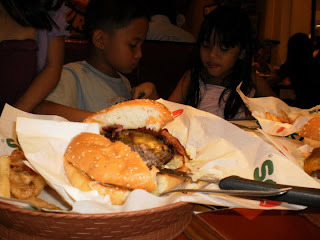 We had a nice stroll at the park and mall while we waited to be seated, and Myrna was asking why it was that crazy in Chili's Greenbelt 5 branch, while the Dubai's branch is not being visited that much. 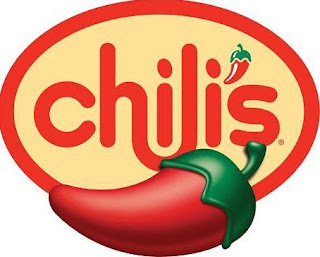 I don't know what to actually tell her, coz it was the first time I will be trying Chilli's which I have heard was famous for Southwestern foods such as burgers, steaks and margaritas. We were there at 5 in the afternoon but we got inside at 7 pm. People were mad about trying to get in just in time for the promo. I just realized that I wore the same T-shirt (I'm the one on pink t-shirt on the first picture above) when we went here to celebrate my birthday last year but we didn't, we ate at Red Crab instead. He, he, he and the T-shirt was a gift. So, I desperately and most patiently waited for our turn to be seated, and so were my company. I just hoped that the wait was worth it for my friends and family who were with me. Well, I was not disappointed with the burgers we had Bacon Burger, Mushroom Swiss and our nephew and his friend had BBQ Ranch. We all enjoyed our huge servings of burgers, the patty is about half an inch thick. With all the toppings of a perfect burger and a home-stead fries. And the burgers, how we all sliced the burgers half, preventing the predicament of having left-overs. Wise enough we did it, so we can still enjoy the rest of the burger at home. 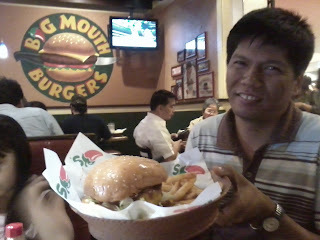 The signature Big Mouth Burger platter. Truly gigantic and palatable! Check out their website to know where to enjoy these, and see what else is offered. Click on the logo. 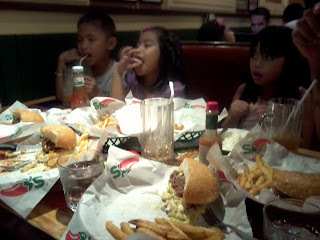 A lot better than Mcdonald's or Jollibee's... 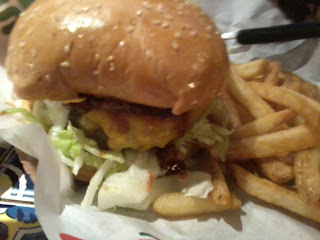 This is fast-food stuff for refined individuals... hahahaha!